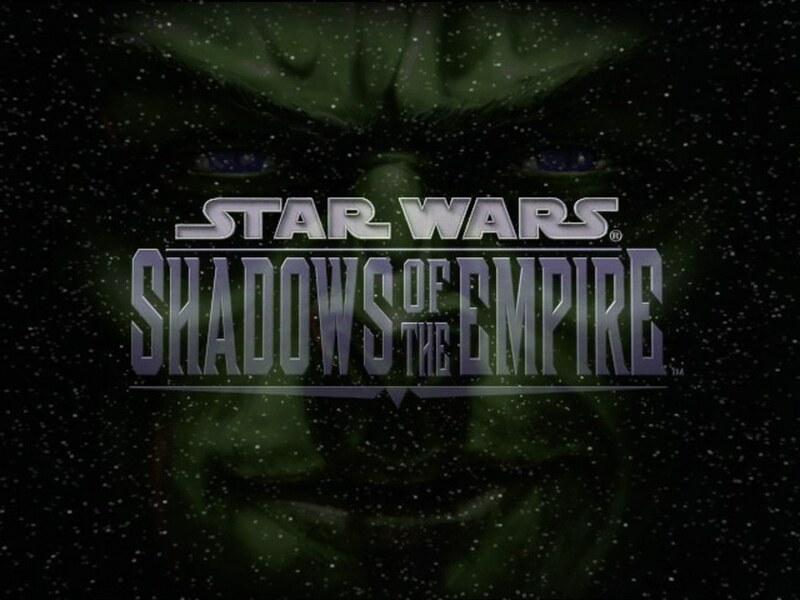 This month is the 15th anniversary of the release of the Star Wars: Shadows of the Empire multimedia event. 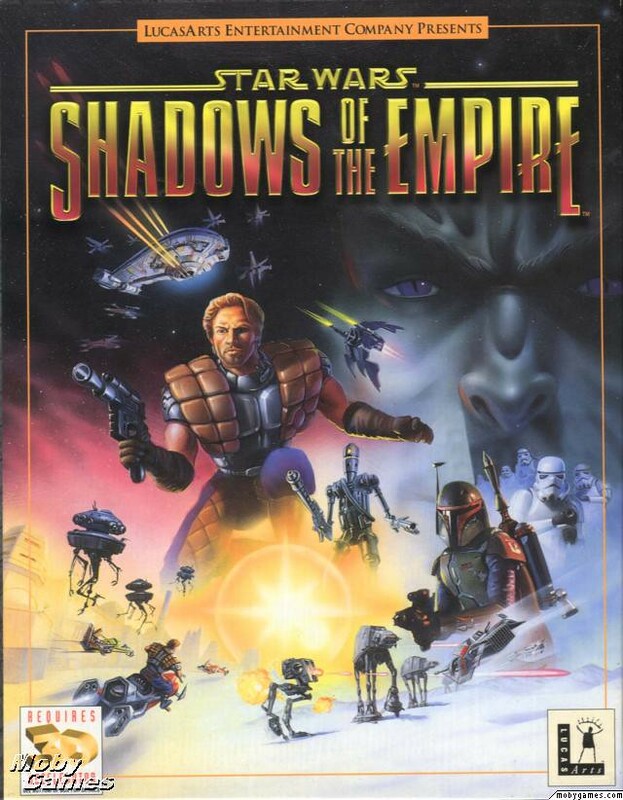 Shadows of the Empire was a huge undertaking by LucasFilm and LucasArts in the Summer 1996. It was essentially the release of a new Star Wars movie, but without the actual movie. The events of Shadows of the Empire take place in the years between The Empire Strikes Back and Return of the Jedi. Up to this point, no other expanded universe material had ever taken place within the timeline of the original movies. This event would also serve as a springboard into the release of the Special Edition trilogy in theaters the following February. To give the whole event a more “theatrical” feel, LucasFilm released a trailer featuring footage from the movies and a voiceover. It was played in front of audiences at comic conventions across the US. LucasFilm decided to pull the trailer, however, fearing that people would think there was an actual movie being released. The trailer was added to the official Star Wars website for the Shadows of the Empire 10th anniversary. Click here to watch the trailer on StarWars.com. The Shadows event consisted of the release of a novel, a comic book, a video game and a symphonic soundtrack. You could get one or more of these things and get a complete story, but you had to get everything to get the full Shadows of the Empire story. 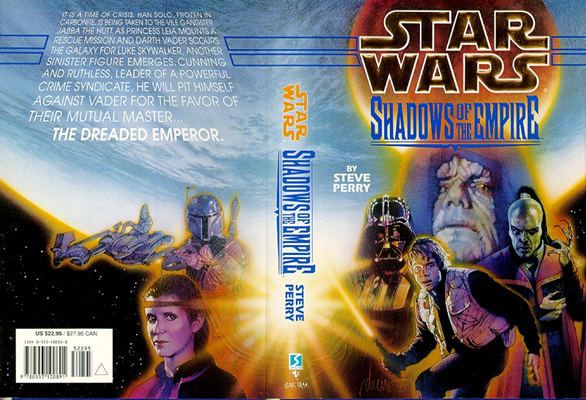 Released first and foremost was the Shadows of the Empire novel by Steve Perry. You would get most of the story from this book. All other media in the Shadows event was based in some way off this book. The events take place several months after The Empire Strikes Back. I bought and read this book when it was released in 1996. I then bought the paperback and read it again a few years after that. I think I even read it a third time after that. The book is good. REALLY good. I read it again last summer and it still holds up. The story is solid, the characters are written fantastically and it’s just a lot of fun. Prince Xizor is a fun villain and great foil for Vader. It’s really fun to see Vader being vexed by Xizor in their constant tug-of-war for Palpatine’s approval. It’s also fun to read the budding Jedi Luke before he becomes the supremely confident Jedi. Han is out, obviously, because he’s in carbonite on Boba’s ship, but we get a new character, Dash Rendar, to supposedly take the smuggler role. However, I hate Rendar as a character. He serves little to no purpose. First of all, he isn’t in Return of the Jedi so you know he can’t stick around. Second, he’s ridiculously immature and and a braggart. Thirdly, the novel also includes Lando Calrissian. Rather effectively, I might add. There was no need whatsoever to even have Dash. I think Perry was forced to use Dash because they needed a new character for the video game. That one gripe aside, I love this book and really wish Perry could have expanded the story a little bit more in a prequel or sequel novel. 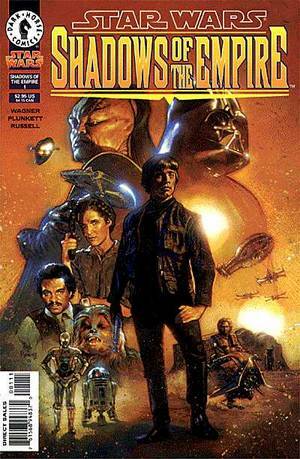 Released several days after the above novel was the Shadows of the Empire comic book. It was written by John Wagner and drawn by Kilian Plunkett. Steve Perry also consulted on the story. The comic wasn’t an adaptation of the novel, but a different set of events that happen within the timeframe of the novel. It’s story focused on Boba Fett and the bounty hunters. The novel and the comic intersected in certain parts, but overall the stories were kept separate. The comic is good, but not great. I like that they focus on Boba, but it just didn’t grab me as much as the novel. 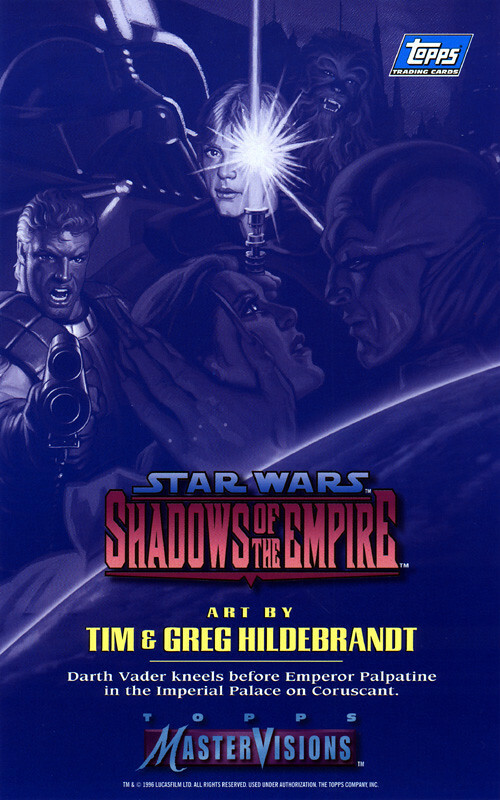 In 1998, Perry did write a semi-sequel to the comic and novel called Star Wars: Shadows of the Empire: Evolution. It followed Xizor’s bodyguard, Guri, and her search for what to do now that Xizor is dead. The sequel is not as good as the original novel or comic, but it’s an interesting addendum to the overall events of the comic books and novels. It takes place a few months after Return of the Jedi. 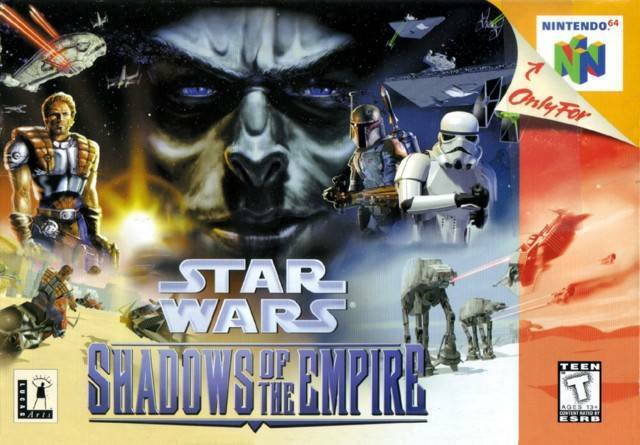 Here are two ports of the Shadows of the Empire video games. The game on the left is for the Nintendo64 and the right is for the PC. These games told the stories of the novel and comic from the point of view of Dash Rendar. I did not have a Nintendo64 nor did I really play PC games, so I never actually sat down to play this. It didn’t help you were playing as Rendar, who I hate. LucasFilm also released this musical score inspired by the novel. John Williams was originally approached to do the music but declined. He did, however, personally recommend Joel McNeely for the job. 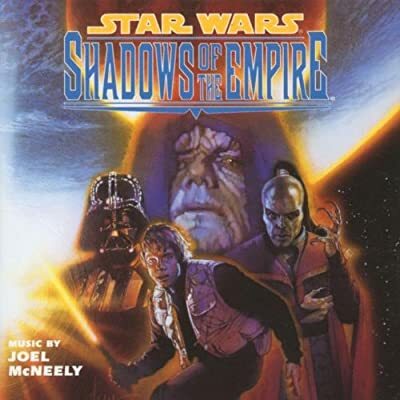 McNeely had composed for the Young Indiana Jones Chronicles so he had a relationship with LucasFilm already. The idea of a musical score inspired by a piece of literature was first discussed for Timothy Zahn’s Thrawn trilogy a few years earlier. When that didn’t happen, the idea was carried over to the Shadows project. And it was a perfect fit. McNeely wrote all new music and only very subtly referenced Williams music. It’s actually a pretty good soundtrack and does have a very distinct Star Wars vibe. I enjoy listening to it. There was also a set of trading cards released with artwork by the Hildebrandt Brothers. The art for this set was truly superb. The Hildebrandts are very popular genre artists. They’ve done work with Lord of the Rings, super heroes, high fantasy, etc. Their work is truly top notch and along the lines of someone like Alex Ross. Check out their official website here. 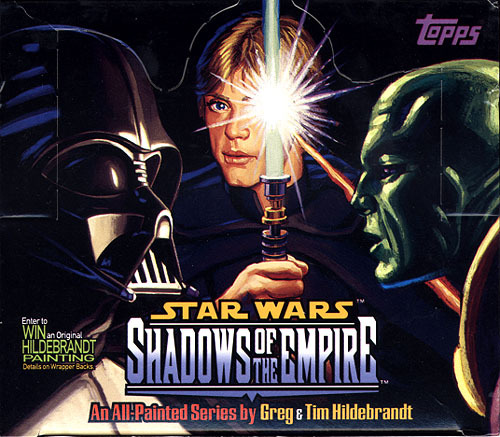 In 1997, a book was released called Star Wars: The Art of the Brothers Hildebrandt that focused on the genesis and creation of the brothers’ paintings for the Shadows of the Empire card set. It is truly an awesome book. I have it. I’ll take a closer look at that book and some of my favorite paintings in the card set later this week. This entry was posted on April 26, 2011 at 8:00 am and is filed under books, comic books, movies, pop culture, Star Wars with tags anniversary, books, comic books, movies, pop culture, Star Wars. You can follow any responses to this entry through the RSS 2.0 feed. You can skip to the end and leave a response. Pinging is currently not allowed. Fond memories of the video game and the novel, here. Never knew the full scope of the whole “Shadows” thing until years later… that is, what they were going for. I was surprised by how much merch there was for it. Very fond memories indeed. Loved the novel. This was back in the days of course when the EU was just taking off. The origin of the thermal detonator and the Boussh disguise! The official story of Luke making his green saber, and so forth. Wow, I go away for a week and tons of new Awesome. Shadows is great. Was evolutions a book or comic? The Guri character appears again in one of the Coruscant night trilogy books along with Xizor (I forget which). Of course, it is set in the Dark Times. Evolution was a comic. 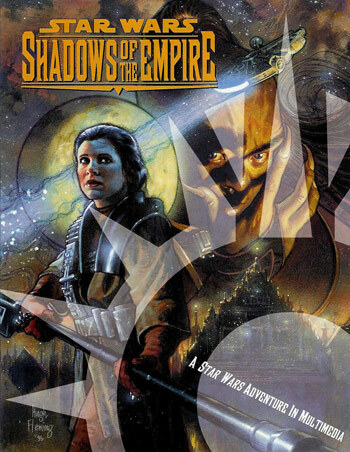 I have it in the collection Star Wars Omnibus: Shadows of the Empire at home if you want it. It also includes Mara Jade: By the Emporer’s Hand. Pax – excellent post. I enjoyed looking back at Shadows of the Empire. 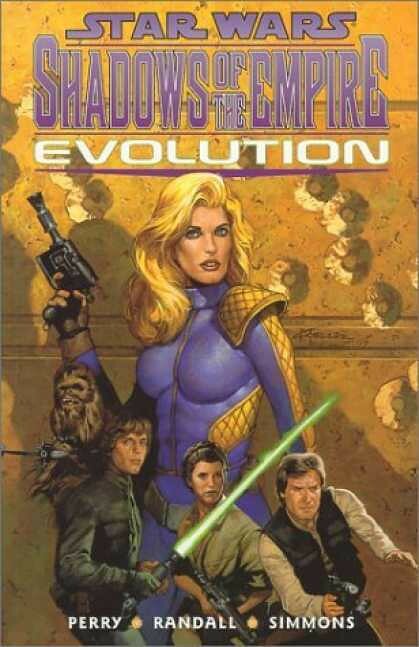 I have the Evolution TPB but I never actually read the Shadows novel. I would probably be more apt to listen to the book on tape. LOL.